Why choose The Rullo Team? Celebrate Earth Day in the Beautiful Fox River Valley! Earth Day is Monday, April 22nd!!! The Fox River Valley is known for its incredible natural environment and residents in our communities take great pride in all the gifts that Mother Earth has bestowed upon our area. Celebrate the great outdoors and protect our environment for this and future generations during Earth Day! There are fantastic community events taking place in honor of the day. Gather your family and join your neighbors at these Earth Day celebrations throughout the Fox River Valley. Help make a difference this Earth Day by helping the Forest Preserve District of Kane County plant hundreds of trees in nearby Big Rock. This is a great way to get active and help Mother Earth. This is a FREE volunteer opportunity. There is no need to register for any group less than 10 individuals. For larger groups, please call (630) 762-2741 or email volunteer@kaneforest.com to register. Head to the Creek Bend Nature Center for this extra special FREE celebration. Make nature themed crafts and complete a scavenger hunt in the nature center. Take a naturalist-guided hike around the preserve from 1:00 pm to 2:00 pm. This 2nd annual celebration has something for the whole family! Discover a wide variety of eco-friendly vendors, listen to live music by Make it a Double and Finn Atwood, dine on delicious food, win incredible prizes in the silent auction, and more. Your children will love the arts & crafts, bounce house, games, salad making station, henna designs, and so much more. Be sure to meet the adoptable pets and onsite wildlife! Admission for this family fun celebration is $25 per person with children under 13 years old FREE! Purchase tickets HERE! This FREE, family-friendly event has something for everyone. Learn something new about native plants, local waterways, sustainable energy, and area food production. Enjoy live entertainment, healthy snacks, seed planting, children’s activities, arts & crafts, and so much more during this fun filled afternoon. 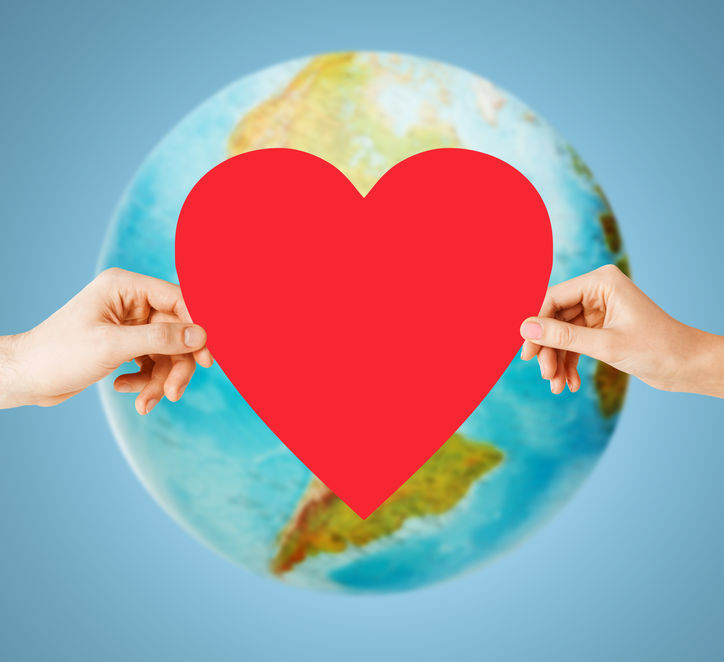 Happy Earth Day from The Rullo Team! Buy your dream home in one of our eco-friendly communities! Give us a call today or visit our website at http://www.therulloteam.com/ to get started! Best Home Maintenance Tasks To Tackle This Spring! Give your Fox River Valley home some TLC this spring to have it in tip top shape for the summer. These projects for inside and outside of your home will help spruce it up for you and your family and keep you comfortable and happy throughout the year. Here are our top home maintenance tasks to tackle this spring! 1. Touch Up Exterior Paint - Boost your home's exterior appearance by touching up the paint. If you do not have any exterior paint on hand and need help matching the color, ask a professional to come out to help you find the perfect match. 2. Wash Windows - Be able to see the beautiful scenery of your landscaping by washing the outside of your windows. You will get best results by scrubbing with a bucked of hot soapy water. 3. Clean Window Screens - Window screens also need to be washed at this time. Gently scrub them with the same mixture. If they are too covered in dirt and grime, it is a great time to replace them. 4. Clean Exterior of House - This might be the most difficult maintenance task on our list but it is also vitally important. The warmer weather gives you the opportunity to wash the outside of your home and, after our winter, it is a good idea. Do a soft washing to update your curb appeal and extend your home's lifespan. 5. Reverse Ceiling Fans - Change your ceiling fans to spin counter-clockwise so that a breeze is created throughout the home. 6. Clean A/C Filter - Keep your family cool all summer long by cleaning the air conditioner filter. Wash with warm water or vacuum cleaner if your system does not have a self-cleaning function. Remember that this task should be done frequently while your air conditioner is in continual use. 7. Remove A/C Fan - After dealing with the A/C filter, now is a good time to dust off the fan. Remove it, clean it, and return it to its rightful place when done. 8. Check Furnace Filter - Your furnace has also been accumulating dust. Remove the filter and give it a thorough washing if the filter is a reusable one. If it is not, be sure to replace it with a new filter. 9. Maintain Washing Machine - Give your washing maching some care so your clothes continue to come out clean. Remove soil buildup from the seal around the door. 10. Inspect Driveway and Walkways - Driveways and walkways take a beating throughout the winter. Check for cracks and weeds and handle those issues as they are found. Afterward, it is a good idea to pressure wash these areas. 11. Clean Baseboards - It's a great time to work on those areas of the house that often get overlooked and that includes the baseboards. Give them a cleaning with a damp cloth to remove built up dust and dirt. 12. Clean Garbage Disposal and Dishwasher - Just like the laundry machine, now is a good time to clean the garbage disposal and diswasher. Refresh both by using vinegar. This will help remove food odors that have been building up. 13. Inspect Hoses - Look for cracks, wear and tear, or any signs of leaks in the hoses located around your house (i.e. dishwasher, refrigerator, washing machine, toilets, etc.). Replace as necessary. 14. Inspect Attic and Basement - Check both of these spaces for water leakage, mold and mildew, and pests. Handle any issues that you might discover right away. 15. Declutter - Get rid of those items that you really do not need around the house by hosting a rummage sale or donating them. If you discover that you have a lot of items to simply toss, consider renting a dumpster so you can do a giant purge at once and be done with it. Check The Rullo Team's website and follow us on Facebook for more helpful home maintenance tips throughout the year! Eggs-citing Easter Events Throughout The Fox River Valley! With Easter right around the corner, the Easter Bunny has been busy hiding eggs throughout the greater Fox River Valley! 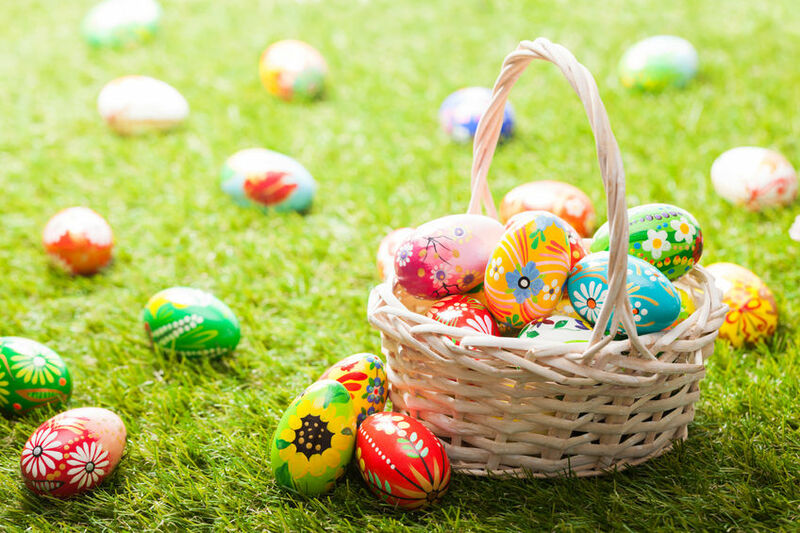 Your whole family will have a blast at all the incredible holiday events taking place now through Easter weekend! Fill up your holiday calendar with these fun filled festivities! Breakfast with the Easter Bunny! The Rullo Team wishes everyone a very HAPPY EASTER! Follow us on Facebook and check out our Website for information on more great holiday and community events! Best Time To List Your Fox River Valley Home To Sell! Which month is the best time list your Fox River Valley home? The answer......RIGHT NOW!!! The month of April is the best time to list your home for sale! With interest rates below 4.5% and lower home inventory, buyers are currently on the hunt to find the best property. Take advantage of the lower competition (it won't last long) by getting your home on the market right now. Research from Realtor.Com shows that the benefits of listing this month are clear. 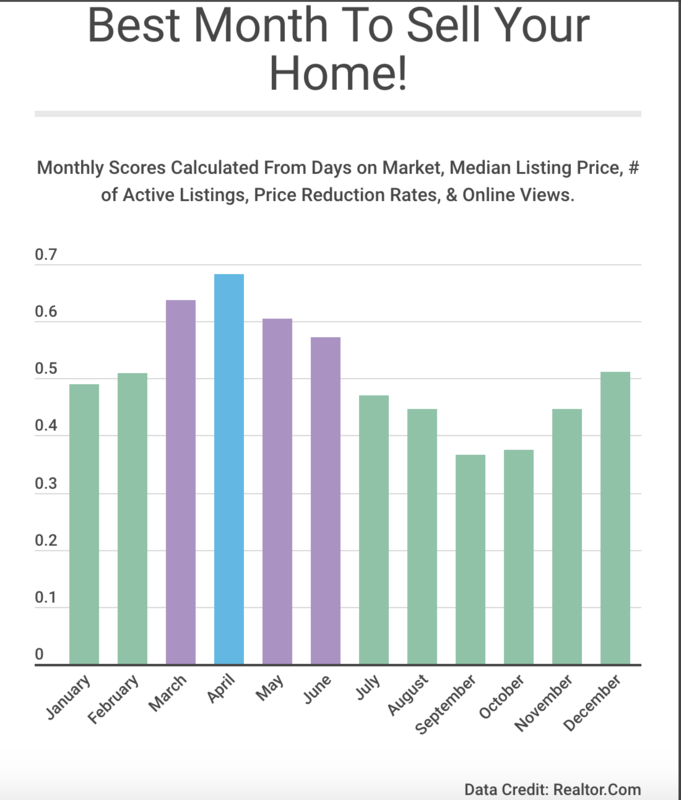 Their data shows that homes listed in the first week of April have 5% less competition, sell 6 days faster, are viewed 14 times more online, AND have 6% higher prices! The benefits are clear! Can't get your home listed this first week? Have no fear! The entire month of April came in as the top time to sell for the year. List your home in April to get it sold quickly and for top dollar! If you are ready to SELL this month, work with the The Rullo Team to get top dollar for your home and sell it quickly! Give our experienced team a call today at (630) 513-1771 or visit our website at http://www.therulloteam.com/. 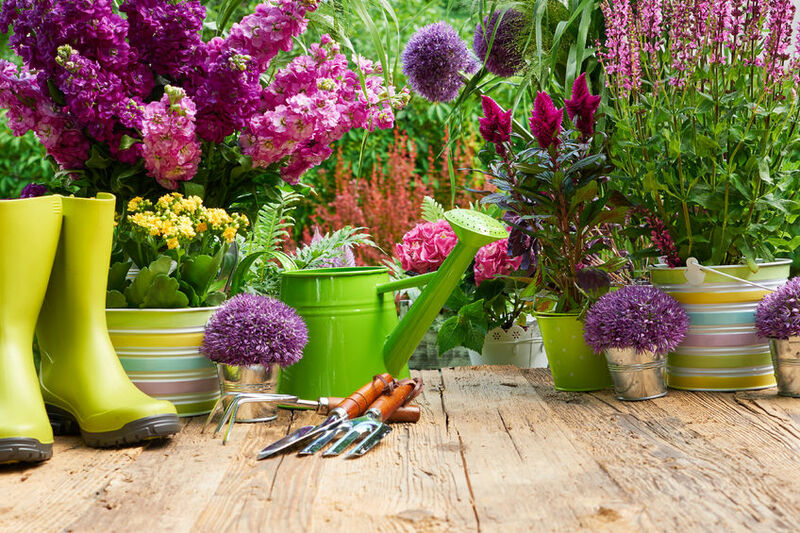 Update Your Front Porch For Spring Selling Success! Are you ready to "Spring" into the Fox River Valley housing market? With the temperatures rising and the snow melting, now is the perfect time to start enhancing your home's curb appeal so it is ready to sell. 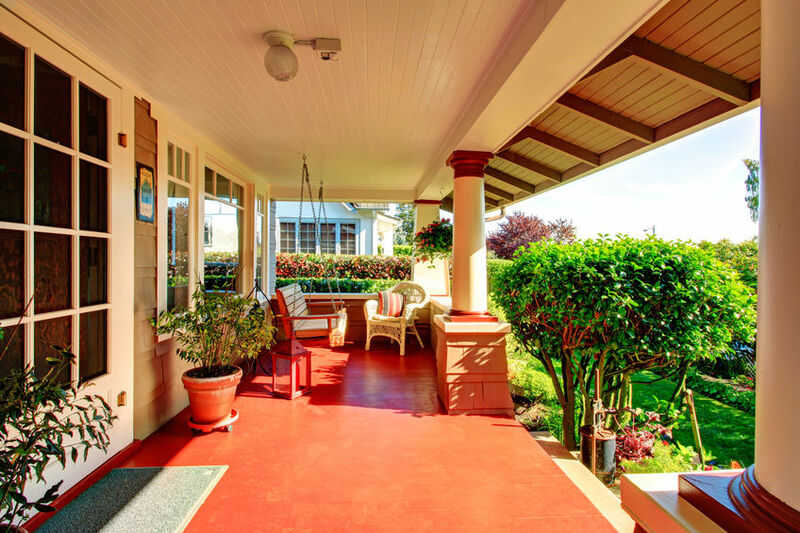 A great area to focus on is your front porch. It will help create an inviting first impression for buyers and, as an added bonus, can be utilized by you and your family as additional outdoor living space! Follow these design tips to have your front porch looking it's absolute best this spring! 1. Draw the eye from the street towards the front porch with the placement of colorful plants throughout your landscaping. 2. Ensure that your front porch is always well lit. Add 3 to 4 different sources of light. Make sure your house numbers are illuminated so buyers and guests can always easily locate your home. 3. Add potted greenery that will last throughout the growing season as well as window boxes and/or vases of seasonal flowers to your front porch for a bright, lush atmosphere. 4. Create a cozy spot to gather with seating for two and a small table. For a cozy, old-fashioned touch, hang a swinging bench. 5. Place a functional and fashionable doormat at the entrance to tie the space together and welcome guests inside. 6. Coordinate color throughout the space with your accents. Make sure that they share all the same hues and complement your home's exterior. A good way to ensure color coordination is to use your home's trim or front door color as a starting point. 7. Keep pests away and beat the summer heat and humidity with a cool breeze from an outdoor ceiling fan or well-placed upright fan. 8. Add some privacy and block the sun with outdoor curtains. Make them easy to open and close as needed and use fade-resistant fabric for longevity. For more helpful Home Selling Tips, visit our Website and follow us on Facebook. Get Your Fox River Valley Lawn Ready For Spring! Get your green thumb ready! Spring is right around the corner! While it might still be a little bit before the warmer weather fully reaches us, now is actually the perfect time to start prepping your Fox River Valley lawn! Complete these lawn care tasks today and enjoy the most stunning yard this spring! All the salt used on the winter roads can do a number on your grass and plants. Give your landscaping a good watering to get rid of this winter remnant. Now is the perfect time to patch up those thin and barren spots around your lawn. Add grass seed or sod to these areas before the ground temperature rises above 65 degrees. This will help keep weeds at bay. After the fall and winter, your yard is likely filled with some leftover leaves, branches, and yard debris. Although this stuff protects your lawn in the colder months, it hinders growth in the spring. Do a good cleaning by removing all these items from your grass and garden. Check the soil for dryness. If it is crumbling instead of clumping, you can begin pruning and fertilizing. Remove old growth from perennials and prune your trees and shrubs. Add a slow release fertilizer to your plants, trees, and grass. Use one that also contains a pre-emergent herbicide to help fight off weeds. Once your soil is dry enough, you can start to add some fresh greenery to your garden. Although temperatures might not seem warm enough, there are some resilient growers (such as bare-root plants, snapdragons, and pansies) that love the conditions of this time of year. Although you cannot plant them yet, now is the time to pick out and preorder the perennials you want to plant this spring. Most nurseries offer deals on these plants at this time of year. Not only will you get a great price but you will also enjoy the best selection! Have your lawn mower serviced and ready to go for the first cut of spring. Keep it running in tip top shape all spring and summer by sharpening the blades, changing the oil, and replacing the spark plugs. For more helpful home improvement tips throughout the year, check out our website at http://www.therulloteam.com/ and follow us on Facebook. St. Charles Home Remodeling Show This Weekend! Have some remodeling and rebuilding ideas for your Fox River Valley home? Do not miss the 33rd annual St. Charles Home Remodeling Show! 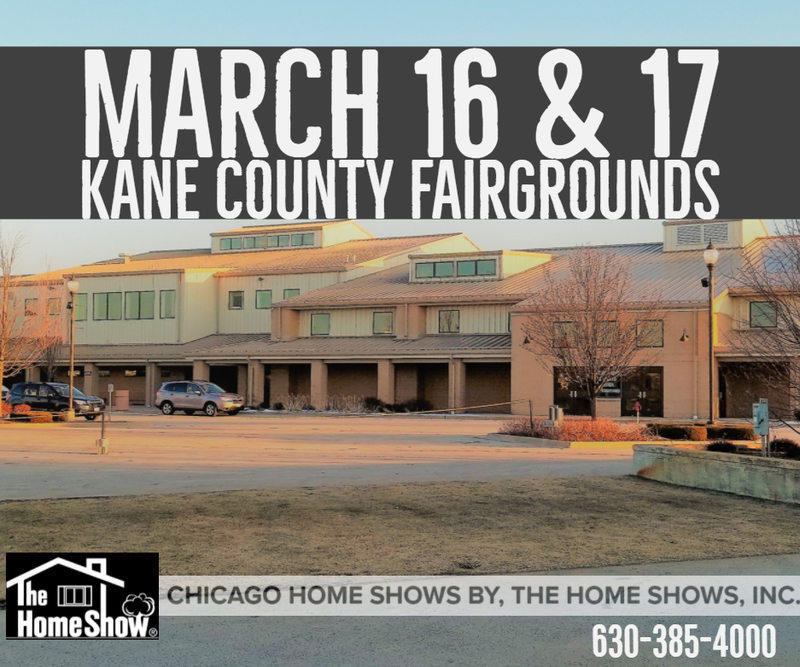 Head over to Kane County Fairgrounds (525 South Randall Road, St. Charles) this weekend to find hundreds of ideas and talk to experts that can help make your plans a reality! 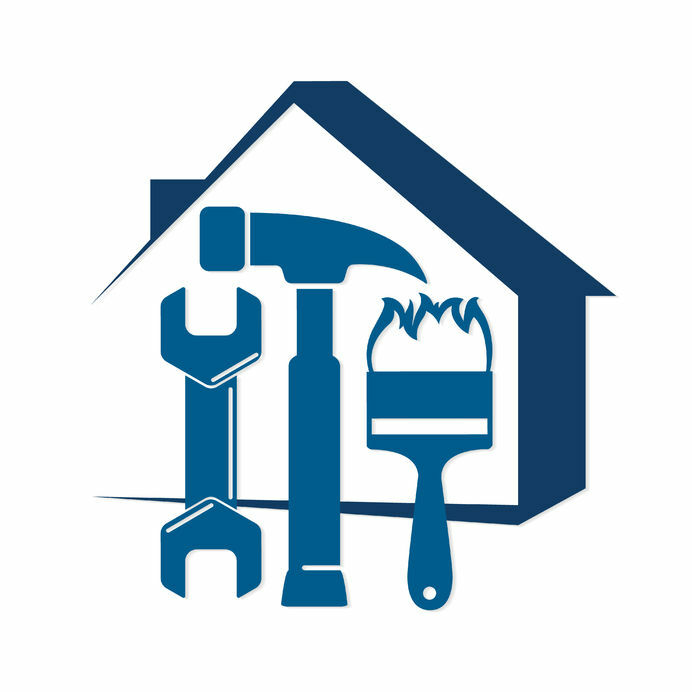 Whether you are fixing up your kitchen and bath, looking for gardening and landscaping ideas, improving your roofing and gutter systems, or any other home maintenance projects, you will find the best local contractors, repairmen, and tradesmen to work with. Come with your plans! Shop for all the items you could possibly need for your projects and get great deals! The show will be held on Saturday, March 16th, and Sunday, March 17th, from 10:00 pm to 5:00 pm daily. Enjoy FREE Admission and FREE parking! Find the Digital Home Show Guide HERE! Follow The Rullo Team on Facebook and check out our Website for great homeowners tips and related community events! Image Credit: The Home Shows, Inc.
Buy Your Dream Home With These Financial Tips! Buying a new home in the Fox River Valley is a major financial commitment. However, you never need to feel like home ownership is out of reach. There are several steps you can take now to help you afford your dream home! Find more Home Buying Tips and Search Homes for Sale in the Fox River Valley, by giving us a call today or visiting our website at http://www.therulloteam.com/. Start Your St. Paddy's Day Celebration in St. Charles! 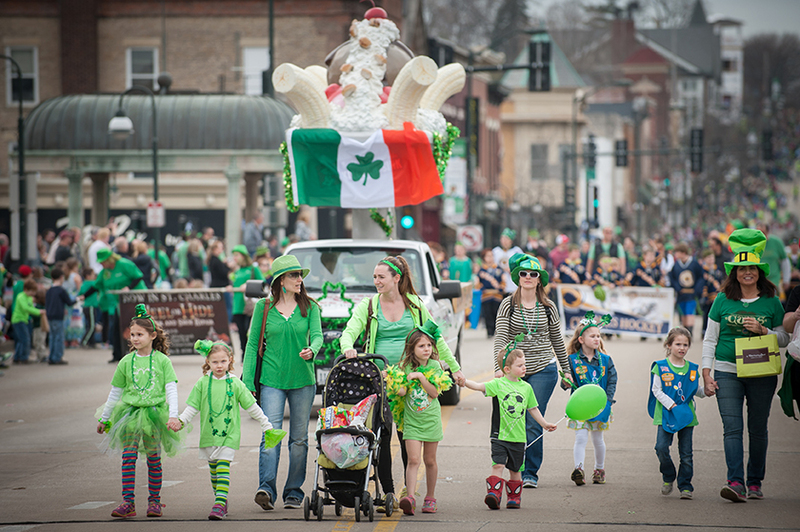 Celebrate the “Luck o’ the Irish” this weekend in beautiful downtown St. Charles! It’s time for the annual St. Patrick's Parade! Kick off the St. Paddy’s Day festivities early with your family, friends, and neighbors! This Saturday, March 9th, head downtown for some holiday fun all day long! Start your day at the Arcada Theatre (105 East Main Street) at 10:00 am for a free dance show. Then at 11:30 am, head over to the St. Charles History Museum (215 East Main Street) for crafts, cookies, and face painting. Afterwards, it is time for the main event….the Parade! Find the perfect spot along Main Street (between 6th Street & 4th Avenue) before 2 pm to catch all the incredible floats, Celtic and marching bands, local organizations and community groups, and so much more! Slainte! The Rullo Team cannot wait to see all of you in St. Charles for this favorite annual tradition! The Rullo's Named Top Real Estate Team In Region! For the 22nd consecutive year, Alex Rullo - Broker with RE/MAX All Pro in St. Charles, was honored for his production in 2018 at the annual RE/MAX R4 International Convention. Out of over 2,300 sales associates in the Northern Illinois region, Alex and The Rullo Team are ranked #12! Alex and his wife Vicky Rullo, also a RE/MAX Broker, have consistently placed in the Top 1% of All Realtors Nationally. Rullo is a charter member of the RE/MAX International Hall of Fame. He has also earned the coveted Circle of Legends Award, the Chairman’s Award as well as the Lifetime Achievement Award, which is the equivalent of three Hall of Fame Awards. Alex and Vicky provide their clients with the highest level of service by offering a full team of professionals with experience and cutting edge skills. The Rullo Team includes Brokers, Sandy Selander and Adam Rullo, Client Care Coordinator, Denise Huelskamp, and Special Project Manager, Kristi Capo. The Rullo Team can be reached at 630-513-1771, rullos@rullos.com or visit their website at www.therulloteam.com to view any home in the USA!